By most definitions, a song is a short bit of music designed for someone to sing. Singing is vocalizing in musical tones, usually with intentionally fixed pitches. With that in mind, a writer of song must deliver at least two elements: a rhythm (the single essential ingredient for any bit of music), and a melody (a pleasing succession of musical tones) which is to be sung. Words are the optional but overwhelmingly common third element, and their inclusion, along with rhythm and melody, constitute the basic essentials of song. So in one sense, there you have it: the three fundamentals of songwriting are rhythm, melody, and lyrics. But in another sense, there’s much more. Though those fundamentals do define the essence of song, they are probably a “given” for most songwriters, and rarely get any conscious consideration at all. So what is the “much more?” Well, for me, the first thing that comes to mind is the the big “x” factor of the songwriter’s talent. But since talent is a thing over which none of us has control, there’s not much to be done about it, so instead I’d recommend that we try to discover what’s available for us to focus on and to practice that might help improve our songwriting. Here are three considerations that I’d rank as the most important of all when attempting to push that boulder up the hill one more time. Write a lyric you can believe in. Find the best musical milieu for your lyric. Concerning number one, I trust we all are too familiar with the songcraft of so much pop music that fails to move us, and I sincerely hope you’ve all discovered lots of music of real integrity which, though clearly in the minority, makes permanent impressions on serious listeners. It is only those songs with that real integrity that can inspire genuine lyric writing that will have universal appeal. Identify and immerse yourself in that great music. Concerning number two, please don’t settle too soon when considering the effectiveness of your melody. There are too many songs that remain mediocre only because a songwriter failed to make that extra effort to ensure that the melody was as compelling as possible. Concerning number three, work diligently to marry your words to the right music. Though occasionally an ironic pairing can work (Every Breath You Take) by contrasting the character of the music with the lyric, a great song typically has music that works in tandem with the lyric to create a whole that’s greater than the sum of its parts. There’s nothing greater in a song than when the music creates a context which both directs the attention and opens the heart of the listener in such a way that the lyric acquires an emotional power it could never have had on its own. 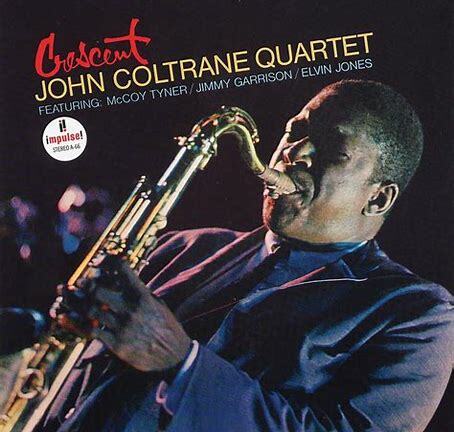 Just before I began to study with Dennis Sandole in Philadelphia in the mid seventies, a great part of my anticipatory thrill was knowing that John Coltrane had been a former student. Dennis seldom talked about Coltrane to me, but when he did it was with certain pride and a big smile. In one anecdote I remember, Dennis described attending a show at a Philadelphia club where Trane's band was booked. According to Dennis, when Trane, who was on stage playing, saw him come into the club, he immediately began to quote some of what Dennis typically referred to as "my literature" (his students will remember the use of this term, and the accompanying gleam in the Maestro's eye). I can believe this, too, because the only player I've ever heard who really sounded like he completely absorbed what Sandole had to teach was Coltrane. Outside of that incidental connection, Coltrane has had, and continues to have, a powerful influence on me. 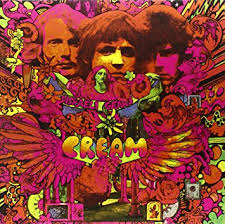 I fell in love with the guitar in 1968 when I heard the sounds of the "British Invasion" players, all playing electric guitars through cranked up amplifiers. There was a very expressive vocal quality to those sounds, a result of the way the amp allowed the notes to sustain and the way a light gauge string could be shaken and bent and made to scoop into notes, yielding a sound more like a saxophone or a cello than an acoustic guitar. I fell in love with jazz in 1974 when I heard the sound of John Coltrane's saxophone playing. 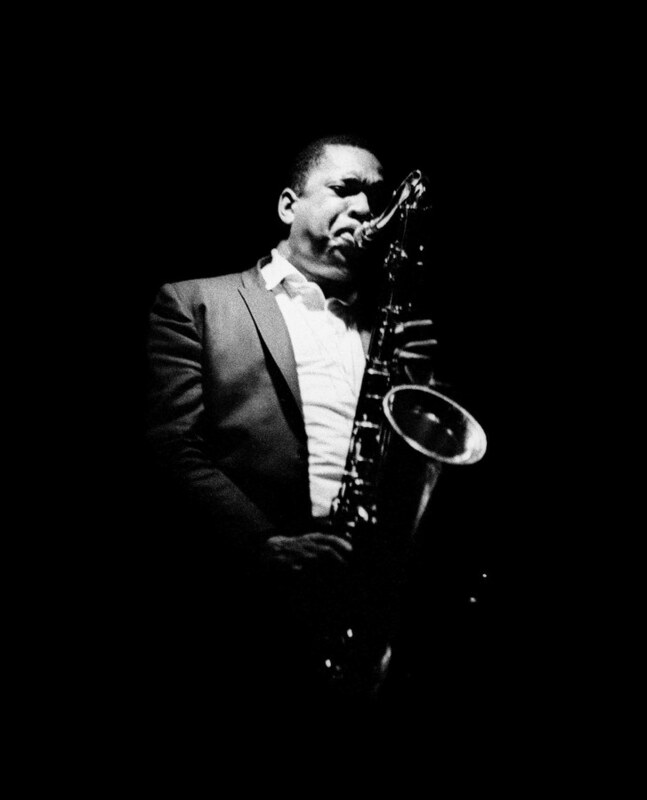 I had listened to quite a lot of jazz players by then, but there was an unrelenting power in Trane's playing that drew me in deeper, and led to a lifetime commitment to learning and listening to jazz. I realize now these two epiphanies of mine are connected by the expressive power of the human voice and the capacity of melody to "light up" the musical mind. Learning to produce those sounds and listening to Coltrane turned out to be two peak experiences for me on my music making journey. In listening to the whole breadth of his work, it's clear that by 1964 (perhaps my favorite year of Coltrane's), his approach sounded increasingly more "vocal;" his playing regularly included a more blues-based vocal-like shout; and he was clearly interested in reclaiming some of the early blues and spiritual roots of jazz. He also seemed to want his playing to express a struggle or a striving, much like many blues guitar players, though unlike many other jazz players who seemed to aim for more of an effortless sounding, controlled virtuosity. I know that Trane's approach spoke to me, and ultimately led to my refusal to give up the sound of an electric guitar through a cranked up amp, in spite of all my efforts to embrace a more traditional jazz guitar tone (still through an amp but without the distortion that comes from cranking it up). For a while I came to feel that jazz and the traditional sounds of jazz guitar were like my second musical language. 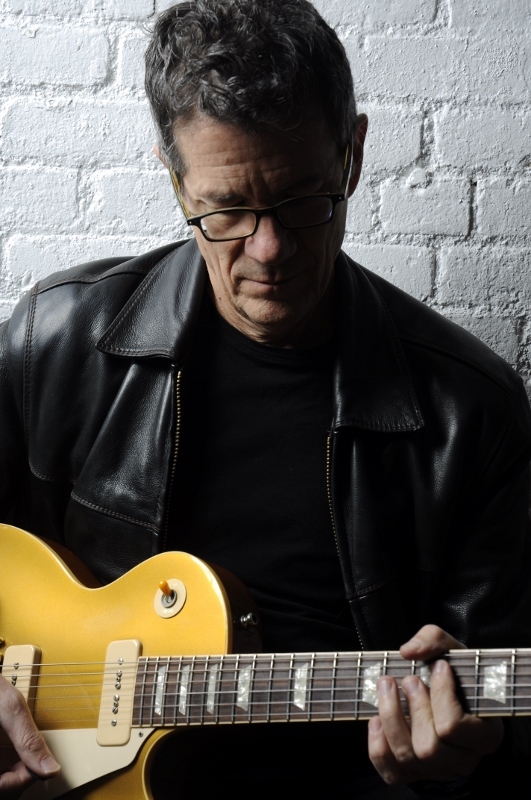 I had started out with the language and the sound of blues and rock guitar, and in a way, for me, jazz and most jazz players' sounds felt like an adopted tongue. But eventually I came to feel that the style of music was less important than the feeling of having a natural, expressive power as a player. Coltrane has often been a great reminder of that: In both of those epiphanies I had fallen in love with the way instruments can imitate the human voice, and to this day the blues and rock sounds of the electric guitar feel like my most natural, expressive tools for making music. Most of what I learned about songwriting came from a complete obsession with music by the Beatles from the time I was a little kid, long before I started playing the guitar. They were probably the single most powerful musical influence on me. So almost any Beatle record would do here, but this one did so much more than some of the others. The record seems conceived as a whole - it taught me to consider an album as a work rather than just a collection of songs. It was so imaginatively arranged and recorded that it has always had a magical quality. That still amazes me now. 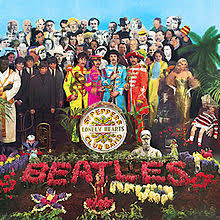 As always with the Beatles, the songs themselves are so strong that they would hold up even without the stunning presentation they get on this record. Recognizing that quality has taught me to try to hold myself to as high a standard as I can when I'm writing. I feel unbelievably lucky to have had this record (one of the first albums I ever bought) as a powerful early influence on me as a budding guitar player and musician. Jimi not only seemed to reinvent the instrument in a number of ways, giving a whole generation of guitar players a completely new world to explore, but with his own very personal creative and musical gifts taught us all about breaking boundaries, thinking imaginatively, playing melodically, arranging well and showing how great a variety of sounds an electric was capable of. All of this plus his incredible presence and charisma which comes through on every track of this studio recording, make this an always inspiring record that belongs on this list. 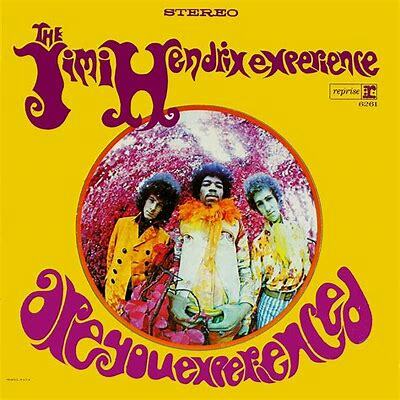 This was another record I bought the first time I ever bought an LP, and it probably got more play than any other. I got so I could lift the needle out of a groove to figure out a part of a lick, then put the needle right back in the same groove to learn the next part! I learned every note on that record. My sound and touch on the guitar was formed by that total immersion in that record, and I'm still aware of that influence after all these years of playing. I didn't know at the time that I was studying my own country's blues heritage second hand, but what a beautiful introduction to that music it was! 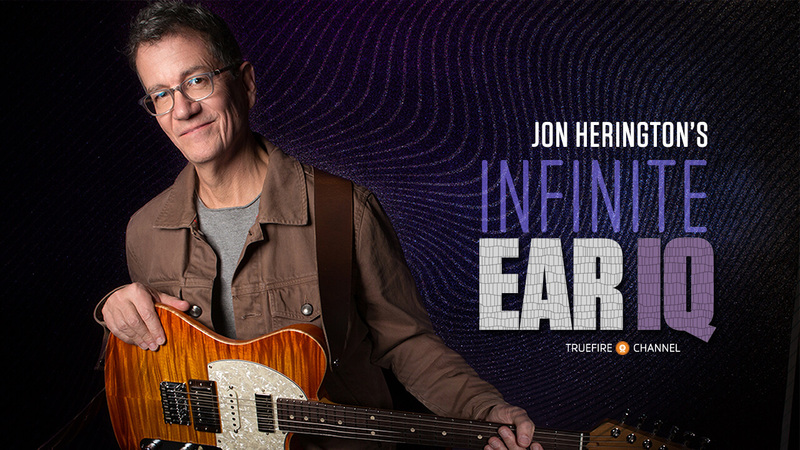 Eric's playing on this record (as it was on a lot of the early ones, especially Wheels of Fire) is so natural, so effortless, and so un-self-consciously confident, that it still amazes me today. When you add the other incredible elements on that record, the unmistakably original drumming, some beautifully unusual writing, some 'British' folk tradition that gets in there, and an undeniable energy and chemistry among the players, you have an amazing work indeed. Though I love almost everything Trane recorded, this record is from my favorite phase of his career, and I never get tired of it. I've spent countless hours listening to him, and whenever I listen again I'm humbled, amazed, and inspired. He had an incredible discipline serving an awe-inspiring inventiveness, originality, presence, and an emotional commitment that may be the deepest I've ever heard. Selecting this one as my favorite from the great number of Joni Mitchell’s wonderful works has always been easy for me, somehow. 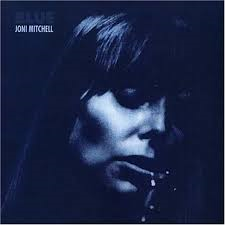 Listening to the entire output of any artist with a long, well recorded career chronologically is always fascinating, and Joni’s adventurous range through her career always struck me as remarkable - contrast Blue with the later Mingus record, for instance. 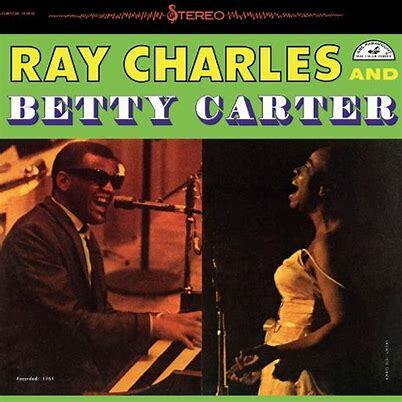 And from the very first recording, she seems radically original and fully formed as a writer, a singer, and an accompanist, whether on guitar or piano. For some reason I’ve always been drawn to this record in particular, as well as the ones just before and just after it (Ladies of the Canyon; For the Roses), so I feel pretty confident that this is the period of her work I love the most. It may have something to do with the way the focus is so much on her alone here, though that’s also true of earlier records. Even though she gets accompaniment help on some of these tunes (most notably from James Taylor’s guitar), it feels like a solo record. She seems completely confident in every way here - she sounds like a musical and lyrical veteran, yet still youthful - never jaded, and so alive and vulnerable. The music is dark and beautiful, like the cover, and though there are equally great songs on her other records, this is the single consummate Joni collection for me. Here’s one I couldn’t stop listening to once I discovered it. The triple threat of Gershwin’s music, Gil Evans’s arranging, and my favorite era Miles Davis is incomparable. Recorded in 1958 and released in 1959, it’s from the same period as the most popular jazz album ever, Kind of Blue, an equally impressive and also groundbreaking record. But on this record Gil’s orchestrations create a unique sonic world which works as the perfect foil for Miles’s powerful and personal haunting, singular voice. Right from the top you know something wild is going on. Buzzard Song begins boldly then quickly quiets down, and that unforgettable sound of Miles’s open horn enters all by itself. (Most of the record was done with open horn; only on maybe 4 of the 15 tracks does Miles use his signature muted sound.) 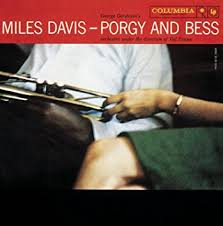 Miles plays throughout this record with a combination of reserve (or “cool”) and confidence and seems at the peak of his powers on his instrument. But every time he enters it’s that amazing sound that just cuts right to the heart that’s most riveting. As good as it gets for me, this one’s a gem for the ages. P.S. A programmatic detail I didn’t remember(! ): listen to the way the entire performance of Here Come De Honey Man fades in like it fades out and also gradually moves from left to right across the stereo field over the course of the song. Here’s a desert island disc if there ever was one. 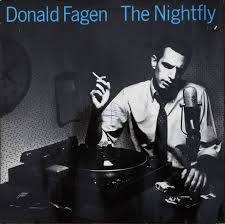 All the stars were magically aligned for this recording: Donald Fagen’s most amazing songs with a compelling overarching concept for the lyrical content of the whole album; flawless performances throughout from the best session musicians in that prime work era for session players; and immaculate recording quality, not unlike its predecessor, Gaucho, the last Steely Dan album of that amazingly inventive period. This is a record I knew well, and am learning to know even better, since I’ve been preparing for the two album nights which will feature this record in its entirety played live from top tp bottom at the Beacon theatre in New York in October. My awe and appreciation for it just get deeper and deeper. Revisiting it will reward you! Here’s another favorite - this record dates from the end of an era of Herbie Hancock’s playing and recording where he employed exclusively acoustic instruments. It was recorded and released in 1968, and, due to his exposure to electric instruments while playing with Miles Davis, Herbie would soon be performing and recording with a much expanded sonic palette. This is one of two Herbie records from this period which I love (the other is The Prisoner). It swings harder than any other recording of Herbie that I’ve heard, and the arranging, for a unique combination of flugelhorn, alto flute and bass trombone, is fresh, distinctive, and adventurous. 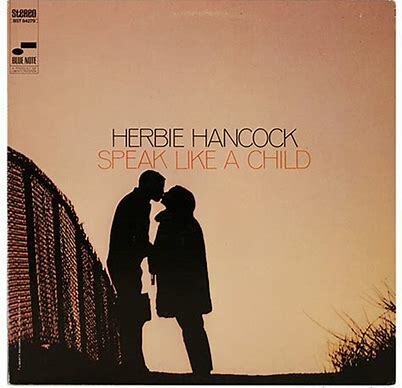 Herbie is the only soloist on the record (unlike on The Prisoner, where his bandmates play, too), and that makes for a kind of beautiful, consistent purity throughout the album, which, in addition to several really original pieces, features Herbie’s always exceptional one of a kind improvising. A band that was so great that it transcended its own genre (the notorious bad word: fusion! 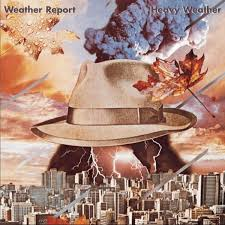 ), Weather Report seemed to singlehandeldy reinvent “jazz.” I use the quotation marks because there is some very unusual almost cartoon-like or “plastic” quality about the way these unbelievably accomplished jazz veterans tailored a radically new suit of clothes for their improvising personalities which allowed them to employ their forward thinking (but traditionally rooted) expressive powers in a remarkably free, fun, fresh way. It always makes me smile in wonder. In Birdland, it’s almost as if Joe Zawinul has it in his mind to write a sendup, a parody, of big band jazz, and somehow, it ironically succeeds in transporting the surprised, happy listener to some odd, brave modern world. It’s a surprisingly coherent album with great composing from three powerhouse writers, Zawinul, Wayne Shorter, and Jaco Pastorius, the electric bass guitarist who redefined his instrument and anchors these diverse composers’ works. Jaco’s solo on Havona, the final track, is one of my favorite guitar solos of all time.